Get the performance you expect from your Serial ATA drive. Cables To Go offers a variety of Serial ATA cables, which minimize clutter, increase airflow and provide Maximum transfer rates. 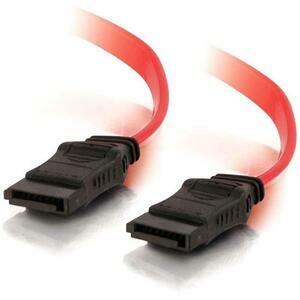 Serial ATA cables by Cables To Go are designed to handle the differential signals implemented in today's technology. This insure increased throughput and reduced data packet loss. The 7-pin, Serial ATA cables permit higher data transmission rates, reduces crosstalk, and improved signal integrity. And these cables reduce over-heating and saves internal space within the CPU unit for easy movement when adding or removing hard drives, PCI cards or other adapters.